Enter your postcode below for the best TalkTalk TV packages! TalkTalk is well known for its great value home broadband, but in recent years they’ve also been offering affordable TV services with the flexibility to suit any budget. 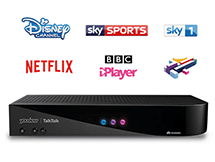 With TalkTalk TV deals you get a free YouView TV box which offers Freeview channels plus catch-up TV and on-demand content, along with the option to add additional premium channels such as Sky Cinema and Sky Sports without long contract commitments. What is the TalkTalk TV YouView box? YouView was the result of a partnership between TalkTalk, BT, Arqiva, BBC, ITV, Channel 4 and Channel 5. Originally dubbed “Project Canvas”, the aim was to create a hybrid TV service which combined broadcast and online content. With a YouView box connected to a TV aerial and broadband connection you can view Freeview broadcasts and stream content from the internet using catch-up and on-demand apps. Catch-up support is built into the YouView EPG so you can go backwards in time and play previously broadcast shows via the relevant catch-up player. In addition to the catch-up players from BBC, ITV, Channel 4 and Channel 5, YouView also includes access to additional on-demand players such as Netflix and NOW TV. As a YouView partner, TalkTalk offers branded YouView boxes to customers and has its own TalkTalk Player app with additional content exclusively for its users. Which TalkTalk YouView box is best for me? The entry level TalkTalk TV Box is a compact device which provides the ability to pause and rewind live TV for up to 30 minutes, and gives you access to catch-up and on-demand content alongside Freeview broadcasts. The larger TalkTalk TV Plus Box is a more advanced model. Just like the basic TV box it offers both Freeview viewing and streaming from catch-up and on-demand services. But it has the important addition of a 300GB hard drive and dual tuners, so you can record TV while watching another channel. It also provides up to two hours of live pause and rewind. Both TV boxes include a remote control and power adapter along with HDMI, Ethernet (network) and aerial cables. They each offer output via HDMI or SCART and S/PDIF audio output, plus a pair of USB2.0 sockets. Note that neither has Wi-Fi support - you must connect them to your router with a network cable. If your router is not close to the TV the easiest way to link them is with a powerline adapter kit. Can you use a TalkTalk TV YouView box without TalkTalk broadband? The TalkTalk YouView boxes can be used without being connected to a TalkTalk broadband service. They will function as a regular YouView PVR and still permit you to access catch-up services and other smart features. When connected to another broadband service the TalkTalk branding will disappear and you will not be able to access TalkTalk specific on-demand services. The TalkTalk TV box is not available to purchase separately, you can only get one as part of a broadband and TV bundle from TalkTalk. What TalkTalk TV packages are available? TalkTalk’s home broadband deals are nice and simple, just a couple of options that you can then customise to suit with boosts. And it’s the same for the TV deals - there are two base packages which you’re free to extend with optional channel packages and subscription services. These are flexible too, so you can cancel the boosts at any time without charge. The entry level TalkTalk TV service has a very attractive price: it’s free! You can take TalkTalk TV with a broadband service for no additional monthly cost. This one includes a TalkTalk TV Box (see above for more details on the hardware) which gives you access to the standard Freeview channels and catch-up players from the major broadcasters. Additional premium channels are available for an extra monthly charge, or you can rent movies and buy TV series. If you’re interested in getting more than Freeview channels for your TV package, there’s TalkTalk TV Plus. 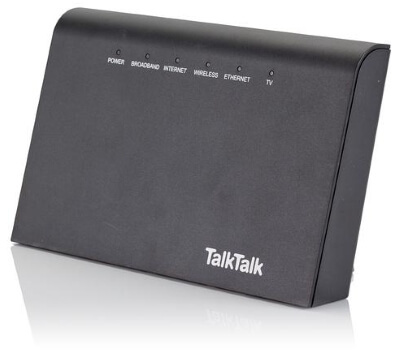 This bundle gives you the TalkTalk TV Plus Box with a hard drive for recording. But the monthly price also includes over 30 entertainment channels, including Sky 1, Comedy Central, MTV and SyFy. What channels are included with TalkTalk TV? While TalkTalk TV can’t quite match the premium TV services for sheer breadth of content, there is still a wide range of channels available to suit most needs, from kids and general entertainment shows to Premier League football games and the latest movies. And of course TalkTalk TV is customisable and flexible, so you can save a great deal of money while still getting access to the shows and movies you want. Disney Channel, Boomerang, Nickelodeon, Nick Jr.
Of course you also get access to the standard choice of Freeview broadcast channels such as Dave, Challenge and E4 as well as the major terrestrial channels (and their associated +1 channels) and radio stations. TalkTalk TV also provides access to on-demand services, which includes many TV series box sets and movies. The channels you’ll receive will depend on the type of TalkTalk TV package you have, and which of the TalkTalk TV boosts you subscribe to. What are TalkTalk TV boosts? One of the great things about TalkTalk TV is its flexibility. At any time you can extend the selection of channels with a TV boost, and since these are on a 30 day contract the boosts can be cancelled at any time without worrying about hefty fees. 6 Sky entertainment channels, including Sky 1, Sky Sports News HQ and Sky Living. More than 100 hours on-demand content from the TalkTalk Player. 32 entertainment channels, including Sky 1, SyFy, National Geographic and Fox. Additional on-demand content, including MTV, TCM and Comedy Central. £12 per month, or included with TalkTalk Plus TV subscriptions. 9 kids channels, including Disney, Nickelodeon and Boomerang. On-demand content including Disney Channel, Cartoon Network and Nick Jr.
24/7 boxing channel with domestic and international fights, documentaries and classic bouts. Sky Sports Premier League, Football, Cricket, Golf, F1, Main Event, Action and Arena. Eight sports channels plus 11 Sky Cinema channels. Wide range of films plus TV box sets on demand. 11 Sky Cinema channels with both classics and brand new releases. Sony Entertainment Television Asia and Zee TV. Should I get a TalkTalk TV and broadband bundle? TalkTalk TV bundles are great value, but they are reserved for TalkTalk broadband customers - you must have a TalkTalk broadband service in order to take advantage of their TV packages. If you’re already a TalkTalk broadband user you can sign up for a TV package at any time, and take advantage of the same deals as new subscribers. TalkTalk Fast Broadband: unlimited home broadband up to 17Mb with a phone line. £20 with TalkTalk TV, or £28 with TalkTalk TV Plus. TalkTalk Faster Broadband: unlimited fibre broadband up to 38Mb with a phone line. £27 with TalkTalk TV or £35 with TalkTalk Plus TV.